After 9 years working mostly with first graders, and realizing that many of the intelligent children where having difficulty learning to read, Mrs. Holman decided to undertake a Master degree in Learning Disabilities. After completion she noticed there was a gap in the teaching methods for visual perceptions and learning by application. Then she discovered Montessori's practical approach to sensory education. Mrs. Holman established her first Montessori school in Georgia in 1972. In 1991 she moved to Tennessee and started Country Day Montessori, which later became Hendersonville Montessori Academy. From 2000-2006 Mrs. Holman created the NCME Teacher Training Center. 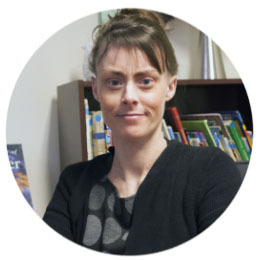 Mrs. Holman is an avid reader, and continues to learn the latest techniques that help children become the most complete and well prepared adults that they can be. Mrs. Hitchings has been teaching in the Lower Elementary Classroom at HMA since 2005. Prior to working at HMA, Mrs. Hitchings was a Speech and Language Therapist in Smith County and Sumner County for twelve years. After having children, Mrs. Hitchings worked for ten years as a muralist and decorative artist. She is our school's resident artist. She is married to a songwriter with two grown children and has one grandchild. She enjoys reading, painting and fiber art in her spare time. Mrs. Miller worked as a marketing manager for HMSHost at the Miami Airport before moving to TN. After twelve years of being a stay at home mom and volunteering at her children’s schools, Mrs. Miller knew she wanted to work with children. She has been assisting in our elementary classroom since 2015. Mrs. Miller is married and has two children. She enjoys cooking, reading, and spending time with her family. Mrs. Rogers has been teaching with us since 2015. She started as an assistant in the elementary classroom before transitioning into a lead teaching position for the primary classroom. Prior to joining the HMA family she worked for a number of years as an in home therapist for children. Mrs. Rogers is married and has one daughter currently enrolled at HMA. She enjoys traveling, cooking, helping others, and spending time with her family. Ms. Gabhart has come to us after 10 years in ministry work and 7 years as a medical assistant. After taking some time off with her family, she decided to join our HMA family in 2015 and has been working in one of our primary classrooms. Ms. Gabhart has one son at HMA. She enjoys spending time with her son and traveling to see her extended family in Ohio and Wisconsin. Ms. Schroeder has been with HMA since 2015 as a toddler teacher. She has worked with children most of her life and started with Montessori as a teenager. Her first Montessori position was as an assistant at Vancouver Montessori School in Vancouver, Washington. Ms. Schroeder has two girls of her own and enjoys spending time with them. She also enjoys crocheting, hanging out with friends, and spending time outdoors. Mrs. McDonald started with HMA in 2017 in the primary classroom after moving back to TN. Prior to joining the HMA family she worked at Dollar General Corp office for 6 years, and started a Master's program in education. She has traveled many places with her husband and two children. Her oldest son is currently enrolled at HMA. She enjoys spending time with her family, swimming, traveling, and skiing. Mrs. Wagner started with HMA this year. She previously taught Spanish for 5 years. Mrs. Wagner was born in Bucharest, Romania. She is married with one daughter. She and her family enjoy dancing, chess, hiking, traveling, painting, music, and karate. Mrs. Phillips has come to us after many years working as a medical coding specialist as well as serving as an art and substitute teacher in Robertson county. She joined our HMA family in 2016 and has been working in our toddler classroom. Mrs. Phillips enjoys spending time with her family.